When you learn how to oil paint or paint with acrylics, there are many great reasons for doing quick studies. In fact, the quick studies should be an integral part of learning how to oil paint. If you are used to doing oil painting or acrylics at a slow pace, then quick studies might push your painting skills to a higher level. 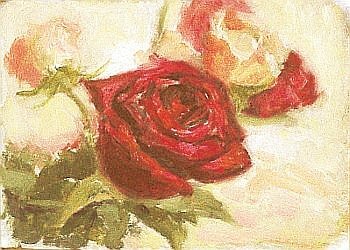 I did this quick study of roses under 30 minutes. The great American painter John Singer Sargent was known for doing many quick studies in order to practice his brush strokes prior to working on the final painting. You will learn the difference between lines and mass. You will become more aware of mass and form, how they are related, and how they are constructed. You will truly understand how to observe like painters do. With quick studies, you will train your eye to see everything in proper order. You will know how to look for the key shapes and values in your subjects. You will have increased brush confidence. This is the major reason you do a lot of quick oil studies. Ever wonder how the American painter John Singer Sargent executed his brush strokes so confidently? After you put in a lot of brush mileage, you will know what your brushes can and cannot do. You will control the brushes, instead of them controlling you. You will learn how to 'feel' your brushes through your fingers, hand, and wrist while you learn how to oil paint. No instructional tips or tricks can teach you that. Only through your own quick painting studies, can you develop those instinctive brush strokes. And that comes from DOING it—not just reading about it. You will explore a wide range of new subjects. By painting everything in sight, you will expose yourself to a wide range of subjects. You may be surprised to find that you can do well with subject matter that you never imagined tackling before. You will see beauty in everything, and learn that it is how you paint, not what you paint, that matters. You will develop better composition and editing skills. You will learn how to keep what is essential for your quick paintings and learn the economy of simple form and shapes. You will constantly increase your exposure to compositional variations. All of this will prepare you for working on larger paintings. You will express color and lighting effects more fluently. The world of colors and lighting effects will open up as you learn to oil paint every kind of subject, in a rainbow of colors across the spectrum of possible lighting conditions. It really enriches your visual language! As you learn to oil paint with the quick study approach, you can work in the studio or outdoors. Life studies are always the best, but a good photograph will work, too. Limit your painting to 60 minutes or less. I started doing quick paintings using 6”x8” (15cm x 20cm) panels. Now that I am becoming more efficient with my time and my brushstrokes are more confident, I have moved on to 9”x12” (23cm x 30cm) or 11”x14” (28cm x 35cm) surfaces. The larger surfaces allow you to use bigger brushes and really allow you to improve the boldness of your strokes. The right number of color tubes to use for your palette is subjective. I suggest three colors plus white palette, or you can use a dual primary colors plus white option (with two colors from each primary color family). If you already have a palette that you are familiar with, stick to that. If you want to add a new color, test it first to see how it mixes with the other colors you use. This will minimize the time you waste second-guessing color mixtures while using this quick study approach. Learning how to oil paint rapidly is not just sloshing paints mindlessly all over the canvas and hoping some magic will come out of it. You still need to know how to see and think. There is a certain methodology to follow, but it allows a lot of room for individual creativity. Keep up the practice of painting fast with deliberate efforts! The more you paint, the ease you would find in learning how to oil paint.